In today’s episode of The Whole Circle Podcast, we’re talking about all things Halloween…. ooooh spooky! Firstly, apologies for no podcast last week, we just couldn’t get to it as we were super busy so we’re really sorry for that. Tracey’s back from her month-long holiday in America so stay tuned in the coming weeks as she is going to fill us all in on her adventure in another episode. She had the best time away with her family, immersing herself in the culture and learning how other people live in another country. Tracey’s youngest daughter had the time of her life by going to the Taylor Swift concert and spending her 16th birthday at Disneyland! How cool is that! In terms of food and being able to continue to live additive-free, Tracey found it pretty easy. Wherever they went they were able to eat additive-free and whenever they needed to find a shop that sold organic food, then Google Maps to the rescue! She actually found it easier to access organic food in America than what she does in Hobart, Tasmania. However, there is an exception to this rule…. Taco Bell! Oh my, that was a whole other story! Jo was also there for a week of that trip and so Tracey and Jo decided to go to Taco Bell together which was an experience they are never going to forget! But more on that in an upcoming podcast about Tracey’s trip to America so stay tuned. But today, we are talking all about how to live additive-free during Halloween. It is getting a lot more popular in Australia. Jo doesn’t have anything against Halloween as she doesn’t know a lot about the history of Halloween as they were not brought up with it as they lived on a farm where there was no trick or treating with the cows (haha) and at that time it was never really a thing and it didn’t become a part of their lives until their own children started showing an interest in it. But again, we don’t really know much about it other than people get dressed up, they go get a heap of bad food and then come back and everyone is feral for the next week. No one does it in Tracey’s street, but she does know people who really get into it. Tracey reckons she would have loved Halloween had she grown up in it and she would have gotten right into it, however, she thinks she is too old now for it and just can’t be bothered. So, if you know all about it, then leave us a review or send us an email as we’d love to know the history behind Halloween. Jo says that last year was the first year her daughter, Eva, came home and asked to go trick or treating and because Jo doesn’t want to stop her from doing things she agreed. They came up with a few little rules which were that she would be allowed to grab whatever they gave her which was all fine but when she got home Jo and Shane had to sift through it all and put it into piles of good and bad food so that they could get rid of the really bad additive filled food which Jo could then replace with additive-free alternatives, that Eva could eat, which Jo had prepared earlier. This way of doing it worked really well for them. Tracey then asked if Jo gives out the good food to trick or treaters who come to her door because she doesn’t want to give out additive filled food? Jo agreed that’s exactly what she does. Last year when Eva came home with her Halloween haul and after they had sifted through the food, Shane then went to put the bad food into the bowl by the door to hand out to trick or treaters and Jo refused for this to happen as she did not want that food going to other kids. Even though she knew it was wasteful, she just couldn’t bring herself to give that food to anyone else knowing how bad it is for little bodies. So, it all went in the bin. A funny little story about Jo’s son, Jacob… Shane was really excited that they were going trick or treating and had gotten right into it getting fake blood, fake tattoos with maggots on them, he found black clothes and he bought cobwebs for the front door…he really went all out! So, we got the kids dressed and then we got the fake blood out and they put some on Eva’s arm with the fake tattoos. Looking back Jo could see Jacob not reacting that great to it. They then went to put the fake blood and tattoos on him and he flipped out. He was 4 at the time. He was screaming and screaming so Shane and Jo put him in the shower and were trying to wash it all off, but the red fake blood had stained his skin. Back to simple swaps…..after a quick Google search, Jo found a heap of ideas on Pinterest so it’s really not hard to be additive-free this Halloween, you’ve just got to do some simple swaps like they did and set the rules around it because you don’t want your kids to have a sore tummy, headache or not be able to concentrate at school the next week or even getting sick. Eva could possibly end up with a sore throat, leg pains or leg cramps and the list of side effects goes on and Jo doesn’t understand why we would want to do that, just to be the ‘fun mum’. Why not just swap it out for some more junk food but junk food that is not laden with chemicals. Get little tubs of peaches that come in a round tub with a clear plastic lid on them. Get a permanent marker out and draw eyes and a mouth on the clear plastic lid to resemble a pumpkin. You can do the same for a mandarin. Draw triangle eyes on the top (on the skin) and squiggly mouth down the bottom. Last year Tracey’s youngest daughter actually made up a Halloween pumpkin by cutting the eyes and mouth out and put a candle in the middle. Get some capsicum and chop it in half, get all the seeds out and then slice them so that they are like little octopus arms or spider legs. Hopefully, you can all picture what Jo is trying to explain. You then get a little bowl of dip and put 8 capsicum arms/legs so that they’re sticking out of the dip. You could then put 2 choc chips or sultanas to resemble the eyes. It’s so easy to be creative with your dips. You can find a really great pumpkin and cashew nut dip on our website here which is obviously orange because of the pumpkin so it’s a really great dip for Halloween. Some cheese sticks and the stringers are fine from an additive perspective, but you need to make sure you are getting ones that are preservative free. Once you’ve found some preservative free ones chop them into 3 which will end up being about 3 cm long per piece. String them apart a little bit and put a pretzel stick inside and you’ve made a broomstick. Make some plain popcorn or homemade caramel popcorn and place them into plain white cups. Draw on the front of the cups with eyes like a ghost or the scream mask. You can also do these on little bags as well. This idea would be really cheap to hand out and most likely cheaper than handing out chocolate or lollies. You could even sprinkle some icing sugar on them and call it ‘ghost popcorn’ or you could even colour the icing sugar orange using Hopper food colours if you wanted to. Chop your peeled bananas in half, put an ice cream stick in them and sultanas or choc chips as eyes and freeze them so that you have ghosts. Peel your Babybel cheese and remove the entire peeling tab. Leaving the wax top and bottom pieces on the cheese, draw some eyes on the top piece of wax and then you have a Babybel monster. A quick Google search of Babybel Halloween Cheese Monsters will show you what we mean. Strawberries dipped in white chocolate all of a sudden become ghosts and then use a cacao nibs or tiny choc chips, if you can find them, as eyes. Get a bandage from your first aid box and wrap your apple up leaving enough room for eyes so that it resembles a mummy and then maybe melt some chocolate onto the apple to create eyes or snap toothpicks in half and stick them into the apple with sultanas on the other end so that they look like eyes. Just be careful with this around little kids to ensure they are safe with the toothpicks. Decorate homemade cupcakes into little ghosts or monsters. There are so many cake and slice options that you can do for Halloween. It’s so easy to make a web look with icing. All you need to do is put your chocolate icing on top of, let’s say, a slice and then just put a few lines of white chocolate and then get a toothpick and run it through so that it resembles a cobweb. You can easily make homemade gummies with gelatin, which you can buy here, and juice and mix them together and get some Halloween themed chocolate/lolly moulds to set them in. Make your own chocolates to hand out with Halloween themed moulds and melting chocolate to set in the moulds. If you have no idea what we’re talking about then jump onto Pinterest as there are tons of ideas on there for Halloween. 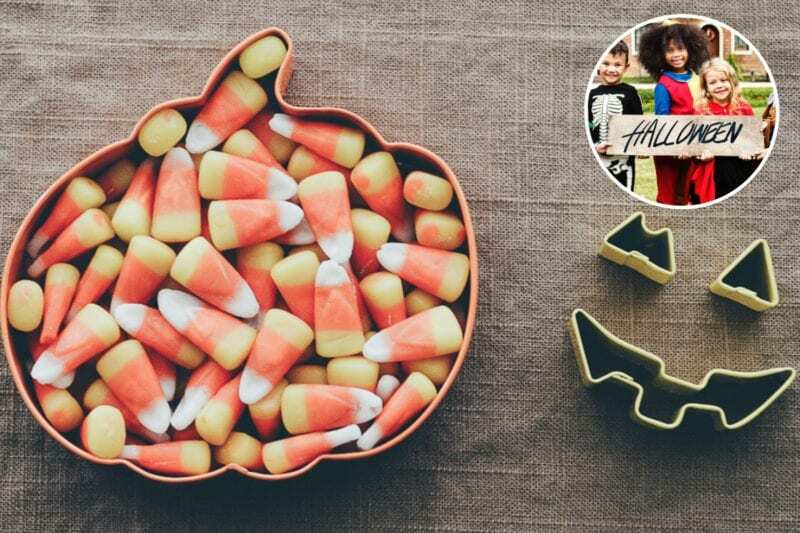 So, there are some really simple ways that you can have an additive-free Halloween and they can even be added to lunchboxes to create some fun for your kids or picnics. You could definitely hand out some of these ideas at your door to trick or treaters. But if you’re not up for making anything and you just need to know what you can buy for Halloween then there’s plenty of options for you so don’t despair. Stay away from foods things that are brightly coloured because most of the time, not all of the time, they will be filled with artificial colours which you just don’t want to be eating. When your little one comes back from trick or treating, and you are sifting through all the lollies, make sure to get rid of the brightly coloured ones. Also get rid of the ones that are filled with a soft centre like caramel, peppermint or strawberry because most of the time they are also going to be filled with additives and preservatives. Popping candy is another that will be filled with artificial colours and additives. Most products will have a preservative in them which will likely be preservative 223 which is best to avoid. What are ok to buy from the supermarket? Full disclosure, this is as of today’s date 26 October 2018, as we cannot guarantee that these products will remain ok from an additive and preservative perspective because company’s change their ingredients which is beyond our control. So, it’s always best to read the ingredient panels to ensure you know what’s in them. These are semi-ok as they don’t have those harsh additives in them. Interestingly from our research, the coloured sprinkles on top are not as bad as they’re not the full-on synthetic colours that are made from coal tar. They do say natural colours including carrot last time we looked so again, check the ingredients for yourself because they may have changed. Tracey found these at Target at one point so check that out, but they had things like ‘Clangers’ instead of ‘Clinkers’ which were a much better option from an additive and preservative perspective. These lollies are fairly ok. Full of sugar but ok in terms of additives. If you are up for it, you could definitely make your own fruit roll-ups. If you hunt around, you will find some shops that will have additive-free choices. Think outside the square because you don’t have to give candy (yep fully dropped an American term there haha), you could instead give out Halloween stickers, pencils or something else with the Halloween theme. Maybe you don’t have to give out junk food. Yep, we get it, there is a stigma around not handing out food, you know ‘oh god, what will they think of me’. But if someone gave Jo’s kids a Halloween pencil instead of additive-laden junk food, she would think they rocked! And that’s what we need to do, group together to say no to handing out the rubbish food and instead give out things that kids can use and that won’t harm them because if we all do it, then it becomes normal. We hope you have gotten a lot out of this episode to make your Halloween fun-filled and additive-free. We would love for you to leave us a review and thank you to those that have left reviews as we just love it. Make sure you hit that subscribe button so that you are notified of each new episode when we release them. Coming up next week, Shane is interviewing Jo and Tracey with a heap of questions that you guys have sent in. They’re excited and scared lol but looking forward to it. So, stay tuned for that one!